Vast tale of two secretive theives who get caught up in the net of religion and politics. They lead with their wits, skills, and hearts into a set of events that will change the course of their world. 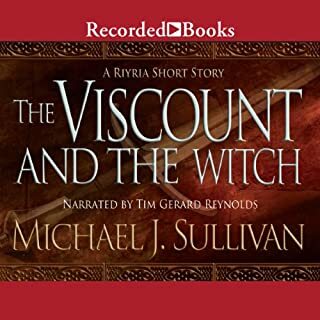 Narrator was fantastic and made bearable a debut script full of long sections of exposition (tell instead of show) and modern phrases in a fantasy world that didn't fit. That being said, the plot was pretty good, the characters are enjoyable and having read a couple of the author's short stories, and seeing the fan appetite for his subsequent works, he does get better. 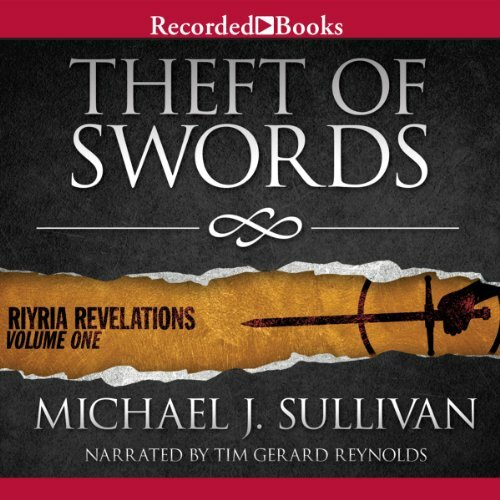 The conclusion of Theft of Swords will definitely convince me to continue reading (listening). 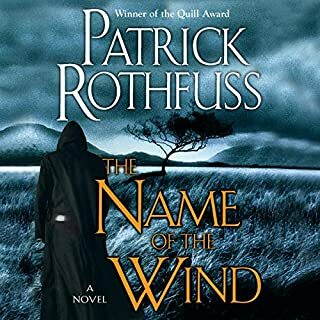 This was my first fictional book I listened to so the narrator took some getting used to but now I love all the voices he does. The story was gripping and the characters were likable and memorable! Nothing I didn't like about this book! Give the story time and you will get sucked in. Reminiscent of Game of Thrones. 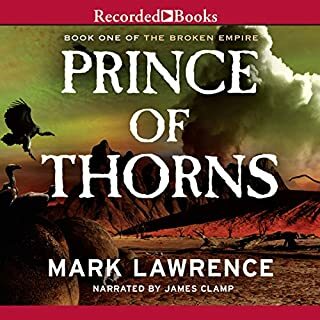 Of late I've been listening to quite a few audiobooks, and I haven't been this impressed by one in ages. Great pacing, fantastic voice acting, and a thrilling story that makes you just want to keep listening. Absolutely loved the main characters! 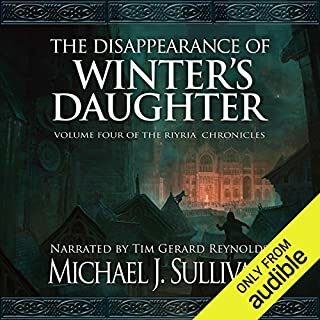 I started listening to the free Riyria short stories on audible and got hooked on the the duo - enough to purchase the first volume. The first and second book have been fantastic fun to listen to! never a dull moment and moves along at an excellent pace. I'm looking forward to finishing the series! Amazing!! Looking forward to the sequel!!! awesome storytelling! fantasy at its finest! anyone who is a fan of Tolkien or Lewis needs to read/listen to this! I got this book as an on sale item, and sometimes these are disappointing. 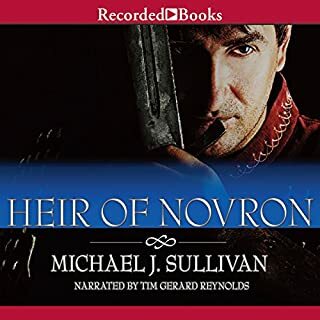 This was a easy to listen , fun book.This book follows Royce and Hadrian as they mistakenly enter an epic adventure. 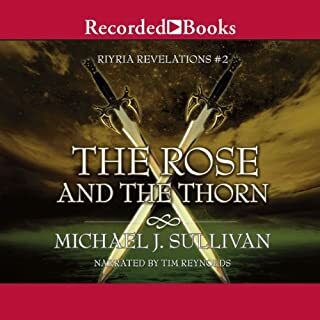 Royce and Hadrian are Michael Sullivans reoccurring characters. This is the first of three books in this tale. First of all, I think it's admirable how author succeeded through self-publication. Way to go! That in itself makes a good story for believing in yourself and your product. The story itself is a good yarn with fencing, fighting, torture, revenge, monsters, chases, escapes, miracles... It's one giant and true love short of being the Princess Bride. To make up for this, Sullivan offers the intrigue of an evil church conspiracy bent on remaking the world to conform to their will. So it is a very interesting story that keeps you engaged. The characters are well composed and endearing. Both the author and the reader play their parts in bringing them to life. Reynolds really brings the individuals into contrast with very subtle changes in voice. His characterizations are not super bold, but they are enough to make individuals recognizable. I am not the largest fan of his overuse of the British, West Country for low-born accents, but that is a very minor thing. Mostly very good. My only issue with the book is that it lacks a bit of polish. Sullivan tends to overuse the word "guy," which sort of messes with the medieval setting. There are also editing flubs in the track, where words are repeated. The text could be tightened up a little bit. But all this is just quibbling; if you don't sweat the small stuff, it is a really fun read. if your looking for a innovative plot, this is not the book for you. However, despite the evil church doing, unlikely heroes saving the day. and a dwarf - this is quite good. Full of elven references and stellar character development. Slow start, but it won me over in the end! Let’s be clear, this book (really, these books I suppose since it’s a two in one) is full of cliches. 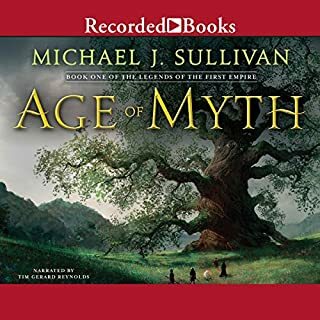 This means that the beginning is frustrating and predictable at times and getting started is not as easy as it has been for many other Audible books I’ve listened to. However, it hooked me eventually and I am a HUGE fan of the cliffhanger at the end of this volume! 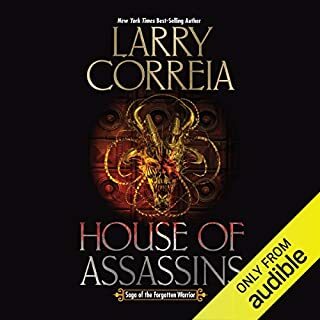 A good end pushed it from a 3 to a 4 story-wise, but I’ll give it a 5 overall because of Tim Gerard Reynolds’s consistently phenomenal narrating (as always) and the fact that Hadrian and Royce make me laugh even if I may not be as big of a fan of some of the other characters! Some fun and witty banter between main characters and some (and I mean some) complexity of plot. A bit predictable at times with typical rehashed characterizations represented in Tolkien style fantasy. Overall a worthy listen for some decently paced storytelling. One thumb up for "Theft of Swords"
What a great series!! It's a complex story with very likeable characters who come to life with believable emotions and lots of humor. Plenty of twists and turns that keep you very interested for many, many hours. I was sorry when Volume 3 ended. I Loved the narrator, very talented! A Delightful listen. Some of the best character development I've seen in years. You quickly come to love Royce and Hadrian and the bad guys are easy to despise. While those caught in circumstances were ... well ... interesting people and played their parts in character. 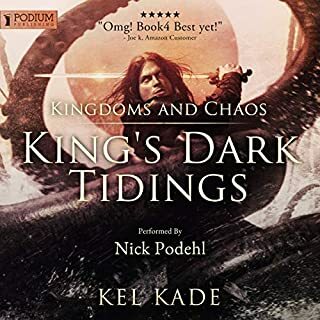 Tim Gerard Reynolds does a fabulous job of catching the character nuances, with just enough voice inflection and variation to help differentiate between the characters without distracting from the story. I liked that you could sometimes surmise what lay beyond the next corner. Sometimes - and then only just before turning the corner. Even when one does anticipate what is going to happen, Sullivan still makes it fun, exciting, thought provoking. I like books that make me smile or that make me say, "Oooh". Royce and Hadrian kept me doing the former while the yarn itself increased the latter.Case in point: Royce's wit is defined very early in the book with this response to Alenda, "Oh, I'm sorry. Did I say your father? I meant the other marquis, the one with the appreciative daughter." And Tim Reynolds makes it sting. "Ouch!" 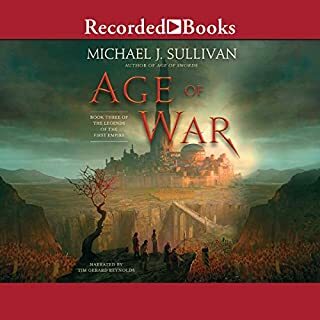 I found myself talking back to this audiobook quite often. All in all, a wonderful adventure. Absolutely Wonderful!! 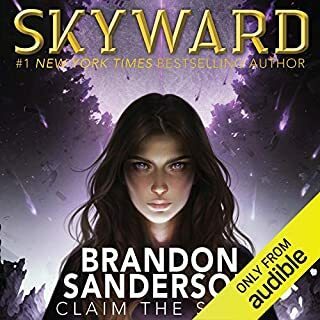 Best fantasy book i`ve listened to ! I`m happy to have discovered this new author,in the caliber of the best authors in fantasy(sword and sorcery). 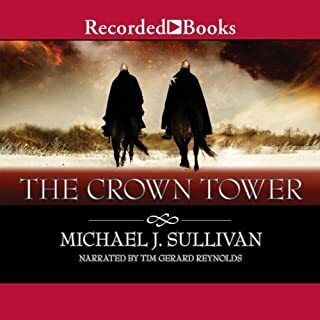 I find this series more mature in the writing,there is not much magic but i prefer a story somewhat realistic and the characters are all very engaging and close to reality in the middle ages,i also like the bit of humor. Really great story and narration! Great writing, great narration, great story! What made the experience of listening to Theft of Swords the most enjoyable? The writing is just amazing, there are no annoying author "habits" that can get on your nerves, like catch phrases or bad characters. 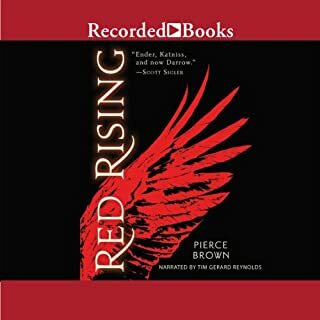 Tim Gerard Reynolds is a great narrator and is as smooth as glass to listen to. It's just good. I mean really good. Fantastic characters, amazing writing, just a perfect book. This is my first time with Tim Gerard Reynolds, but it won't be the last. 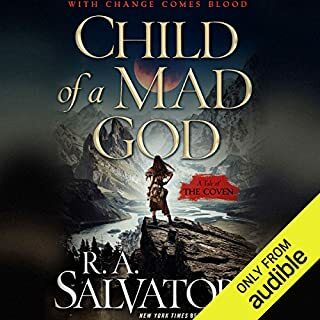 I plan to listen to the whole series as well as the follow up series the Riyira Chronicles. These thieves will steal your heart! I couldn't be more happy with a book and I'm so pleased that this is a series so I can get to know all the wonderful characters and backstory even more. Two books in one - keep listening!! If there were a way, I'd have given the story 3.5 stars. 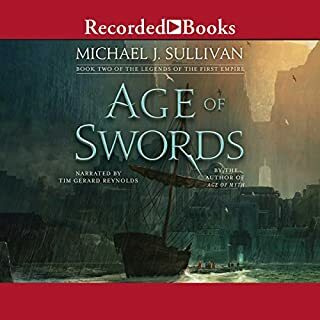 It says it in the description, but in case you missed it - this audio is two books combined into one audiobook. Which is good choice on the part of the audio publishers. If I'd listened to just the first book, I may not have continued. It's not bad, it's just not something that would inspire me to listen to 5 more books. I didn't really care about the characters and it seemed like a pretty cookie cutter sword and sorcery. HOWEVER - in the second book, the story really hits it's stride. It's nothing revolutionary, just solid writing with fun characters and an enjoyable storyline. Which, in my opinion, is more than we're getting from a lot of fantasy writers of late. 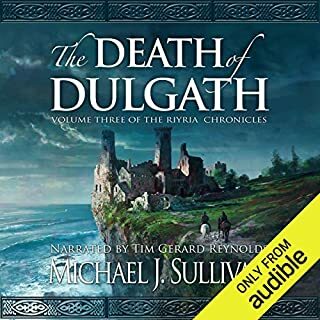 By the time I got to the end of all three audio books I was hoping to find more by this author. 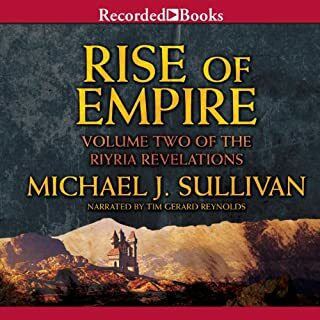 To quote from the author himself about this series: "The Riyria Revelations, especially in the beginning, is little more than fast-paced light fantasy. 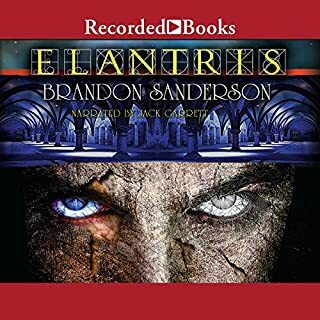 As the series progresses, I think you'll see more depth both in the world of Elan and the characters. This was a purposeful decision and a dangerous one. It means that by design the first book is the weakest of the set, but enables me to end it with a resounding bang."